On this most romantic day, it seems appropriate to talk about love, affection, and passion. Artists such as Renoir, Jean-Léon Gérôme, and Constantin Brancusi have used love as themes in some incredibly moving masterpieces. 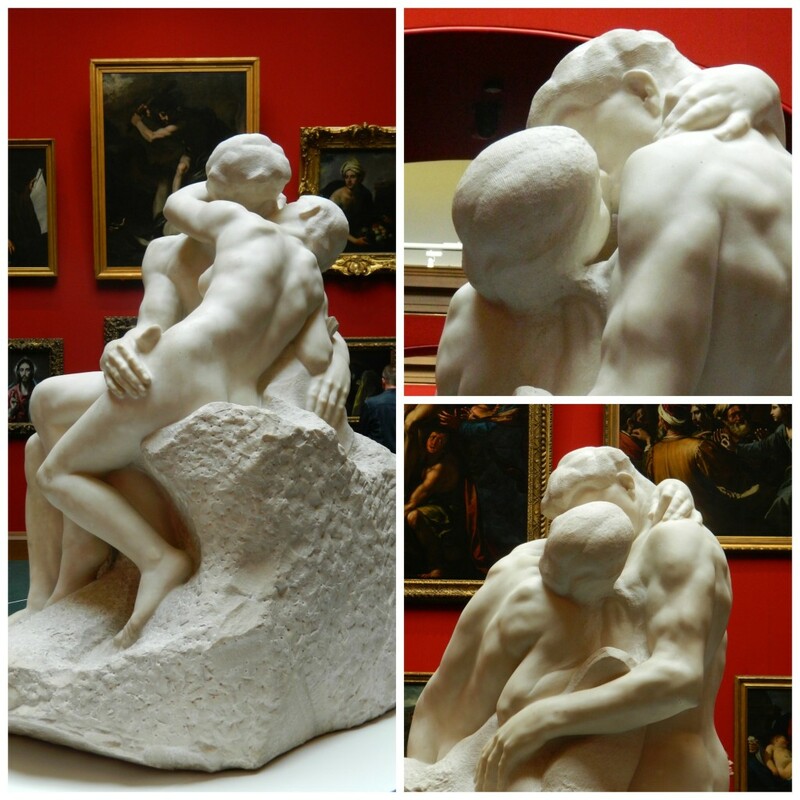 And I’m thrilled to have seen in person two of the most famous works to focus on, well, smooching. 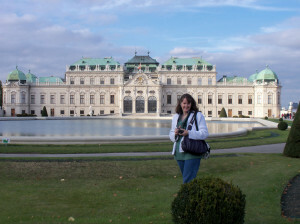 The Belvedere Museum in Vienna, Austria houses a fantastic collection by the master of “gold painting,” Gustav Klimt. 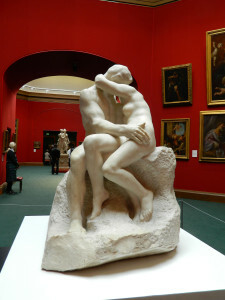 But its crowning glory, at least to me, is called The Kiss (Lovers). It was created in the early 1900s. 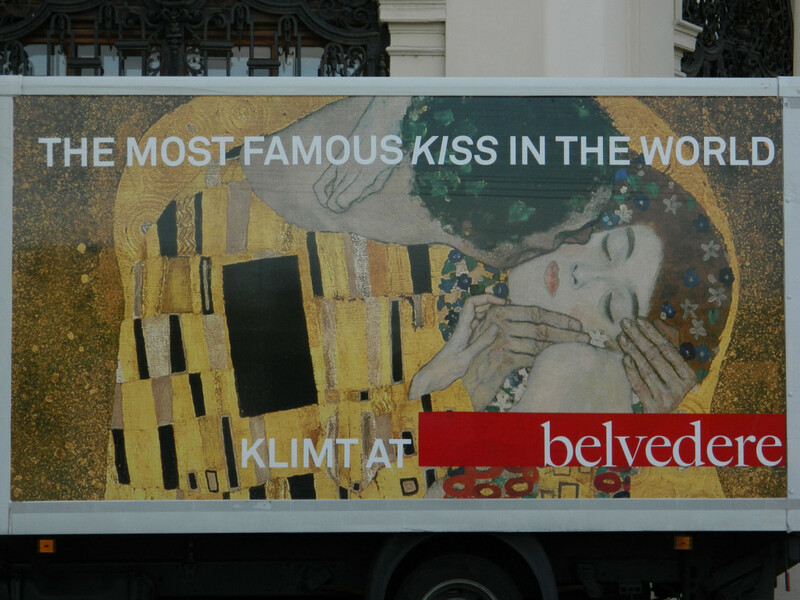 And rumors say that Klimt himself modeled for it, along with his lover Emilie Flöge. The whole town was excited about the exhibit! I have loved this painting most of my life. So when I found out the real thing was being showcased in a special artist anniversary exhibition at the Belvedere while I was visiting the city, I jumped at the chance… and it more than lived up to my expectations! 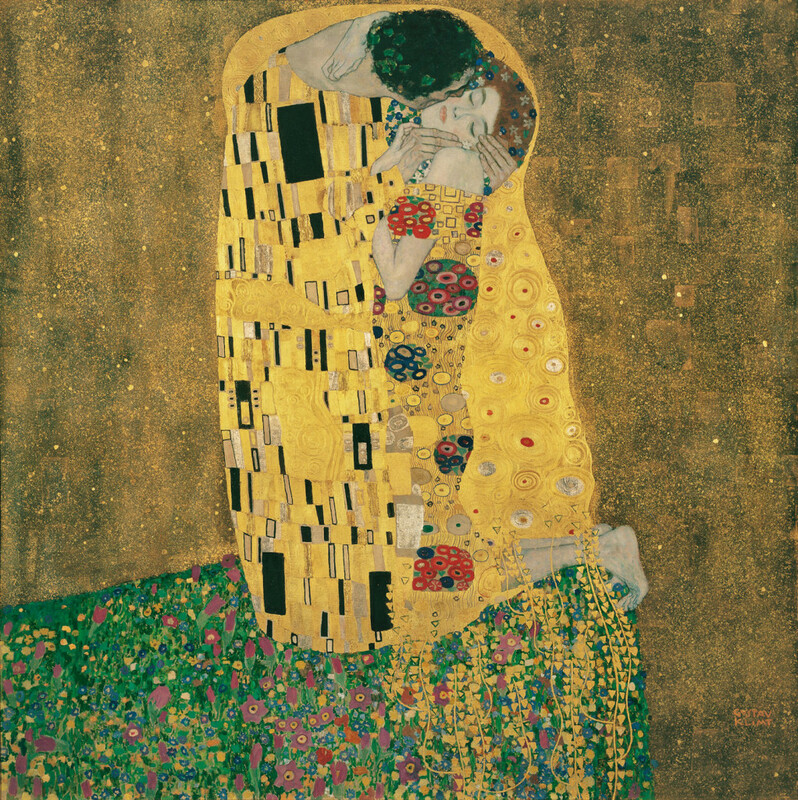 In fact, I spent an hour looking at it, walking around to look at other paintings during Klimt’s “Golden Period,” including the divine Judith I, and then always coming back to stare again at the beauty that is the Kiss. Six months later I had the opportunity to see Auguste Rodin’s larger-than-life, oh-so-passionate (and simply gorgeous) sculpture, which is also named The Kiss. At the time, it was on loan at the Scottish National Gallery in Edinburgh. I was a little surprised when I walked into the free museum to find this very famous marble sculpture so accessible to the public. It was securely placed on top of a table that was roped off with thin metal lines, but none of the sculpture itself was hidden behind glass or barriers as I’ve seen before. Also, the museum allowed photography as long as the flash wasn’t used. So I went a little picture crazy! What are your favorite kiss- or love-themed paintings? And have you had a chance to see them “live?” Leave a comment and let me know. Me at the palatial Belvedere. Loved it! 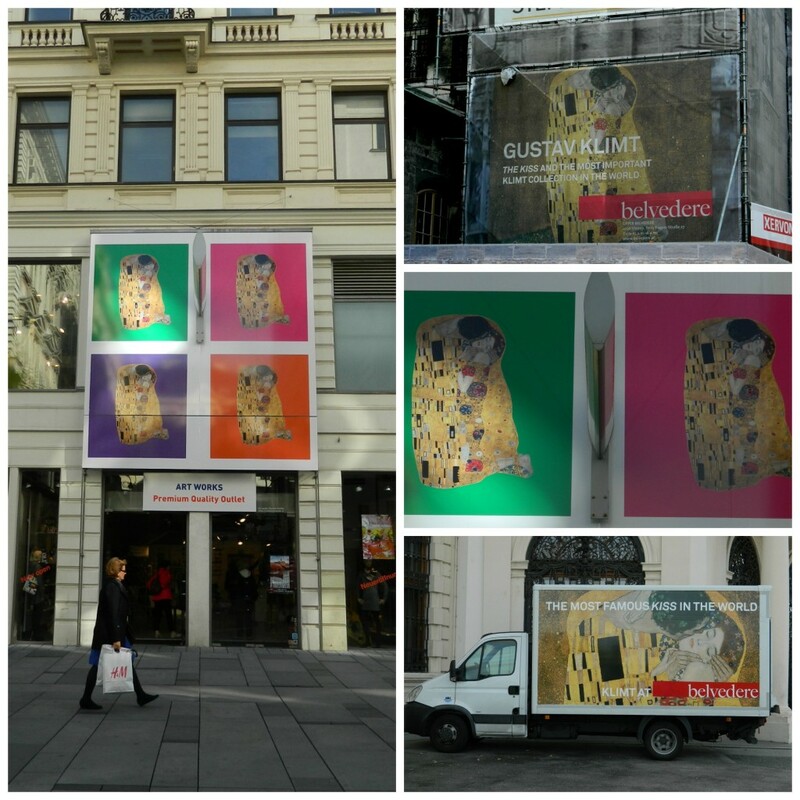 I too had the privilege of seeing the exhibit of “The Kiss” in Vienna when it was there. It was so beautiful that it took my breath away. Thank you for the beautiful pictures of both of your favorites and for telling the story behind them. You’re welcome! I’ve always liked art, but it’s really only been the last few years where I’ve taken time to wander around some great museums during my travels, instead of just hurrying in and out. Glad I finally figured out what a blessing this is! I love Bracusi, Sandy! How wonderful that you got to see this in person — and thanks for the heads up. I’m bookmarking your link in case I ever get back to Paris. I’d love to add a third kiss sighting to my inventory. By the way, the NY Metropolitan of Art has another “kiss” I’d love to see (actually called “Pygmalion and Galatea” by Gerome: http://www.metmuseum.org/collection/the-collection-online/search/436483 ) But they don’t currently have it on display. Some day! !